​By the end of the day Tuesday, after traveling for more than 25 hours, logging too-few hours of rest and going on an all day shopping expedition in Kampala, I returned to home base with only one thing in mind; SLEEP. My hosts (a wonderful Ugandan husband and wife team) told me later in the week that they couldn't believe I didn't take a day to lay low after the journey from America to Uganda. They said to each other, in a way that only Ugandans can, " Oh.....she's still moving??" They called me "strong" but the more applicable term here would be "bull-headed". And in hindsight, I SHOULD have planned an extra day to give my central nervous system a fighting chance. If I would have taken a team or a friend or a board member with me, I would have planned that extra day to rest. Wouldn't have dreamed of pushing them to get up and go full-throttle the very next morning. That night, as exhausted as I was, I struggled to sleep. Tomorrow we were headed out to Nijja (Ny-juh) to welcome the kids to their new home-away-from-home and I was missing a bag and felt unprepared for all the logistical changes that needed to be made. The heat was unusually.......hot. And the wood frame underneath my mattress kept shifting and collapsing beneath me. It took all of my strength to push and pull it back into place and then extreme caution was needed to mince my way back onto the bed in a way that would not cause another crashing downfall. The power was out and my flashlight was, of course, in the missing bag. Now these were ordinary first-world problems that should have been either maddeningly funny or only mildly irritating. But because I was alone, sleep-deprived and in a third-world country, they quickly became problems that made me want to turn around and go back the way I came. And I know this is unbelieveable, but it took me another 36 hours before I cashed in my tough-girl tickets and exchanged them for a novel idea; Leaning into the strength of my Father. I found Him waiting for me. And His arms weren't even crossed. Douglas, our a-little-TOO-fearless driver, picked me up in the morning with Fred in tow. I don't go anywhere without these guys as they are my protectors, translators, negotiators, heavy-weight lifters and most assuredly my friends. We packed gear for two days and headed north to Hope Vision Primary School in Nijja. None of us had been there before but this was the school where our kids were going to be enrolled and board at. And we were expecting the children to arrive within a few hours after us. They were coming down from the north and we were going up. This was to be the culmination of one journey and the beginning of the next. Honestly, I'm finding it difficult to express my heart and still give you the facts and details that you all need to know and hear. Some of you are saying, "Tell us about the kids! 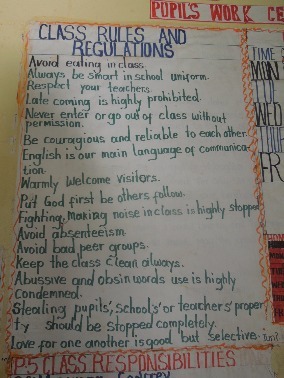 The school! Tell us what happened! How are they adjusting? What were the unexpected costs and detours? Did they get our letters? While the rest of you are hoping to hear more. The journey of my heart. And how God showed up in the most incredible ways for me and for these children. Who are now part of your heart and your story. After two hours of driving we stopped to purchase all of the larger items that could not fit in our car. This included 26 mattresses, the jerricans, sandals and lord knows what else. 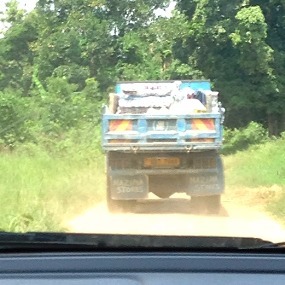 We turned onto a dirt road from the main road and I assumed we were almost there. Twenty minutes later I realized this school was back in the African BUSH. How could there be a school back here? I expected to see an elephant charge out at any moment or somed naked natives with their bows drawn, up in the trees. We were surprised to come to a large, metal gate that was pulled open by three or four eager children. Beyond that gate was Hope Vision Primary School. This school is one man's dream come to life. His name is Pastor Elias and he grew up in this rugged, untamed terrain from a little boy to a teenager and into a man. His village was his world. But children like himself growing up here had no access to a school and no money to travel and board at a school far away. So he dreamed to build a primary school in his community that would glorify God because of His miraculous hand in raising it up and meet the needs of the community. And indeed, it stands now as an ongoing testimony to what God can do with one man with a vision and the faith and tenacity to see it through. 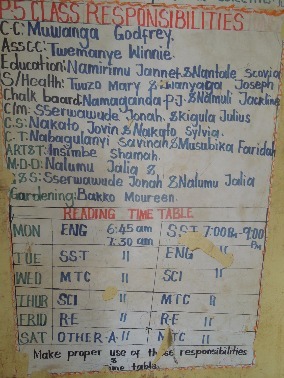 Hope Vision Primary school is for children from preschool to Primary 6. The director is Pastor Elias' wife, Pauline and she is just as passionate about this work as her husband is. They hope to someday have a secondary school here but for now they serve children in primary only. The classrooms are big and roomy and the structures on the grounds are well-built. When classes are in session they are full of life! Chanting, singing, laughter and the hustle and bustle of chairs scraping the concrete floor and the teachers presenting their lessons can be heard in every direction. 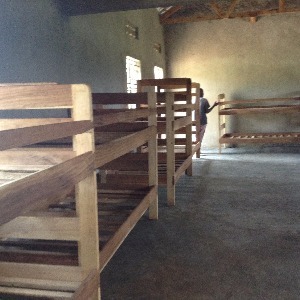 The "dorm rooms" for the boarders (our kids) may look primitive to you in this picture. But the beds are sturdy and new, the room is large with plenty of space to move about, and the concrete floors are swept clean every morning and evening. 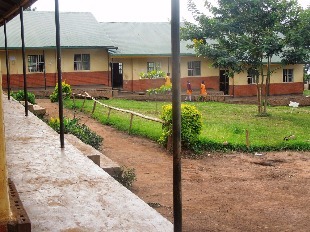 There is plenty of fresh air moving through the windows and the girl's and boy's dorms are separated by housing for the teachers and staff. I took this photo before any of the children arrived. But I envisioned the delight these kids were going to experience when they claimed their very own bed! You can't underestimate how exciting this was going to be for them! 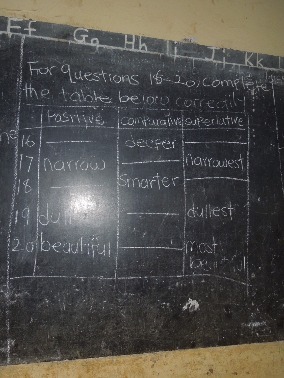 Many of the children that attend school here are from the surrounding village and they arrive at school in the morning and return to their home at night. 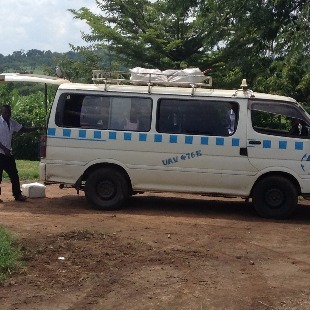 Our children are boarding because their home with Pastor Peter in Kyankwanzi is a few hours away. 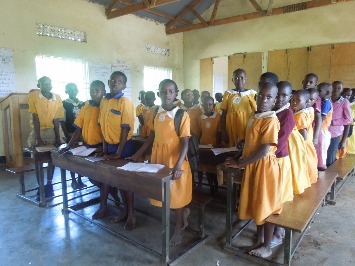 The children attend church on Sundays and currently Pastor Elias holds services in one of the larger classrooms. 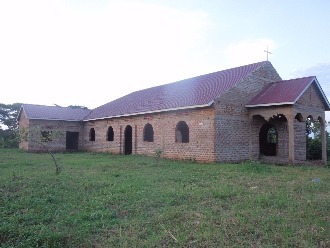 But a beautiful, new church building is being constructed and is so close to being ready. It sits on a hill overlooking the school grounds and miles and miles of African bush and is just a short walk away. Every brick that you see in this church building was made by hand and placed through a labor of love. When I stepped into the seemingly empty structure to see the interior, it was dark and still. But my eyes slowly adjusted and I could then make out a figure up front at the altar.....walking slowly from one end to the other.....hands down, and then up and then clasped behind her. An older woman was clearly in deep communion with God and I was told that there is someone at the church at all times , praying and interceding. The people rely on Him for their next meal. The next rain for their crops. There were so many moments during this trip where everything around me faded into the background and the tangible, unmistakable presence of God stopped time. My entire life's journey and all of Africa's vulnerable children were compressed into that moment. And the sovereignty of God rendered me speechless. I stood there, suddenly aware of my smallness. I'm simply one of those bricks. Placed as part of something much bigger and stronger than what I could ever be on my own. And certainly not responsible for holding up an entire building or even a wall. Excited voices rose up from the school yard below. The children had arrived! And their lives were about to take a dramatic turn. Good News. Good Gifts. Good God. First Two Days in Uganda!